I would not have thought a Sonic the Hedgehog art book could ever be amongst the best in a field usually catering towards modern blockbuster games full of lush environments and detailed costume design, but hey, turns out I was dead wrong. 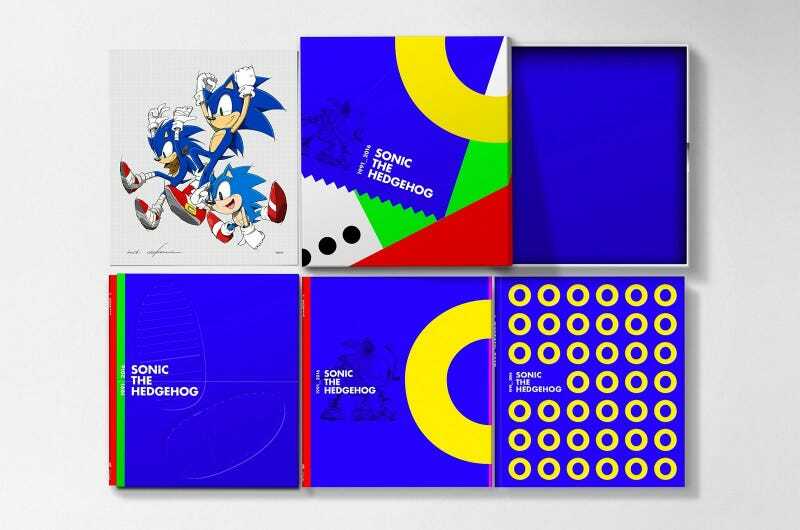 Sonic The Hedgehog 25th Anniversary Art Book, published by Cook & Becker, is a tome aimed at anyone who has ever been into Sonic, not just those clinging madly to...to whatever he is today. And having had a good read through it over the weekend, it’s pretty damn good. The book is gorgeous to behold, and full of all kinds of art, from the classic promo posters and cover images we’re familiar with to sketches and concepts that you’ve likely never seen in your life. The whole design of the book, from the cover on in, also has a great 90s feel, reminiscent of Sonic’s old level intro screens. But what really makes it great is that alongside the art it also serves as a fancy illustrated history of the character and his evolution, with the front half of the book stacked with interviews with guys like Yuji Naka, Takashi Iizuka, Kazuyuki Hoshino and Yuji Uekawa. Sonic is a series whose history isn’t exactly as enshrined in my memory as, say, Mario’s, so first-hand accounts like this are an interesting read. But I’m also including some shots of the copy I read at home below. Note that while this is a look at the $120 version of the book, notable for its fancy cover (which doubles as a reading stand) and signed art print, if you just want the book, it’s available for $47. The book didn’t ship with those smudges in the top-left. Don’t have kids. The outer cover folds in the middle to create this reading stand, which is something I will now hope for/expect from every fancy video game book. The regular pages are printed on thick glossy stock, but a highlight are these carbon pages which have a real “sketchy” look and feel to them.